Admittedly, one of the cooler new features of Android O (which might be called Oreo or Oatmeal Cookie depending on who you ask) is its native support for picture-in-picture video. Just like on the iPad, Android users will be able to enjoy their videos thanks to a floating movable window that will run atop other apps. Superb! Due to the fact that Android O is merely existing as a beta at the time of writing, few apps support this neat feature. YouTube and VLC are among the more popular names, but an even better-known app is joining the fray - Google's popular Chrome browser has recently also scored support for picture-in-picture video, which is probably good news for all enthusiasts out there that are living on the edge with Android O installed on their handsets. 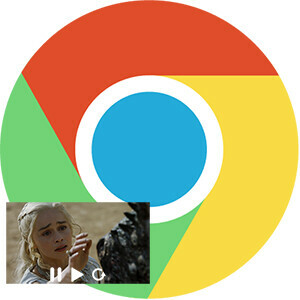 To get Chrome's picture-in-picture video playback feature working you only need to launch said video in the browser and then just hit your Recent apps button twice. Voila, the app will get minimized but the video will continue to play in a tiny window that can get hurled around the interface. Currently, only the developer-centric version of Chrome is confirmed to support the feature, but we are certain the regular version of the browser wouldn't take long to score it as well. Wow.. "Just like on the iPad". Samsung phones has been doing this PIP since ages. They just made a whole article yesterday with more words in it than most of their front page articles combined about how the world was waiting for the iPhone release 10 years ago around this time. They have to push product or else they just don't get Apple event invites, it is a requirement now. This is how Apple cows the majority of tech media outlets, those that don't tow the line get axed from review units and events. Those that tow the line well get cushy jobs at Apple eventually a la Brian Klug and Anand Lal Shimpi of Anandtech. Samsung & LG is doing this for ages but PA is "i" lover. That's why Apple is being hated. Yet another handy Touchwiz feature stock Android is just getting a taste of, even iOS copied it earlier...albeit only on the XXL iPod touch, still not on the iphone.